Hidden between the quaint Derbyshire villages of Church Gresley and Swadlincote is a surprising homage to 1950’s America. Literal in name – the 50’s American Diner is an old fashioned dining cart that once traded in Cambridge, Massachusetts, and has now found an adopted home in the midlands. We stumbled across it one Sunday afternoon and were fortunate to grab a booth and a ‘shake. The Joint: The 50’s American Diner, John Street, Church Cresley, Derbyshire, DE11 8EJ. Best to skip their official site and head to their Facebook page. 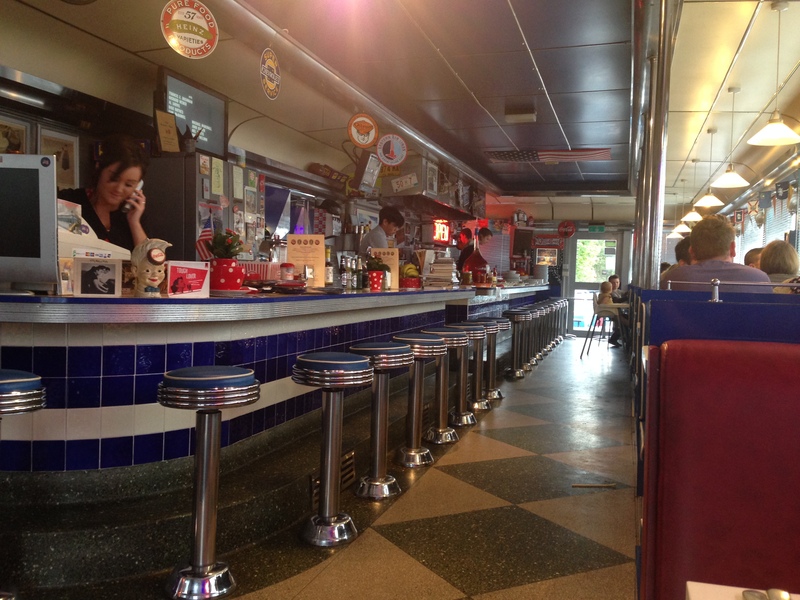 The Vibe: With pop-culture references from post-war America littering the walls, and a solid soundtrack featuring the likes of Elvis and Buddy Holly creating the atmosphere, the 50’s American Diner is a real treat. Despite it’s fairly remote location it’s a thriving joint and regularly welcomes over 500 diners on weekends. We were fortunate to find a spare booth, despite not having a reservation, and settled down quickly to take in the huge menu. The milkshake menu was our natural starting point. We figured you couldn’t sit in an American diner and not indulge in a fattening milkshake. There’s an array of enticing flavours to choose from too (including toasted marshmallow, bakewell tart, and bubblegum) but we settled for an old classic chocolate and banana shake. It arrives with a glacier cherry on top and could easily be a meal in itself. The 50’s theme continues in the burger menu too with references to celebrities throughout. You can have a ‘John Wayne’ with BBQ and grits, a ‘Bob Hope’ with bacon so you can ‘ham it up’, and a ‘Marilyn Monroe’ with chili con carne as ‘some like it hot’. Leak links admittedly but a fun touch. We seemed to side with the Italian influences though and treated ourselves to a Joe Di Maggio burger and an Italiano Hot Dog. 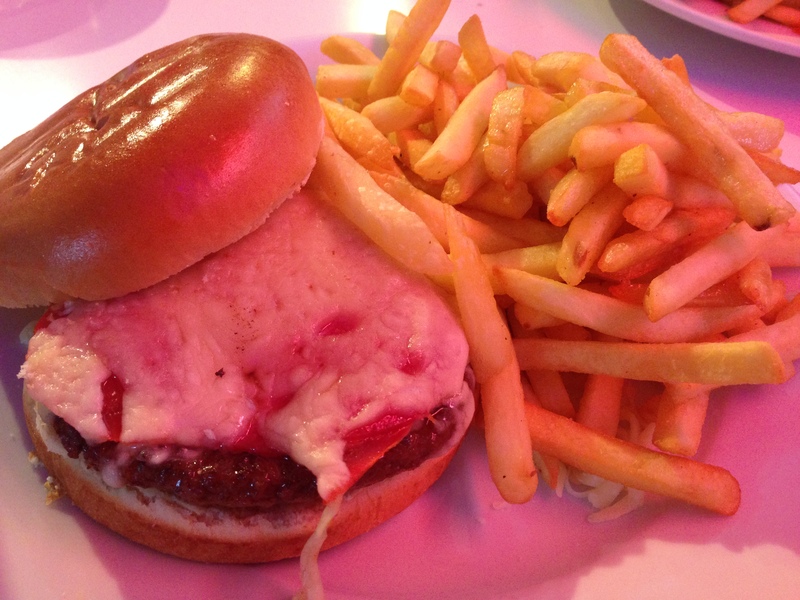 The Joe Di Maggio burger, a tribute to the Baseball Hall of Famer who played for the New York Yankees until 1951, is topped with tomato, cheese, slices of salami, and a sprinkle of oregano. Now we’ve had better burger patties but the added flavour from the meat and herbs made a huge difference. You then get a mountain of hot fries as a side, comfortably as big as anything we’ve received in modern day North American let alone the 50’s. 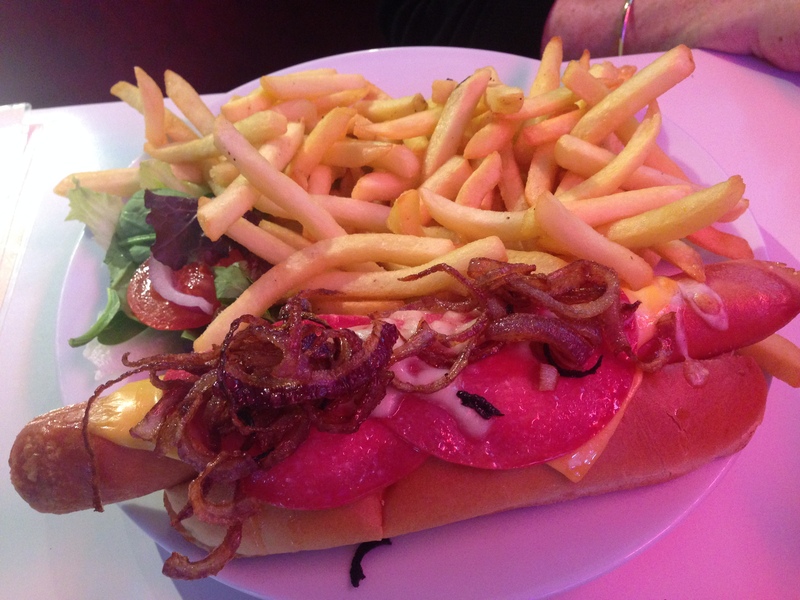 The Italiano Hot Dog is your standard American hot dog in a glazed bun but topped with Italian salami, cheese, fried onions, and covered with a sprinkle of oregano for added flavour. It’s a meaty mouthful already and that’s before you tackle fries too. We’re big fans of adding more meat to a hot dog and this one worked well. Admittedly the food at the 50’s American Diner doesn’t blow you away but you certainly can’t complain about the portion sizes or the experience as a whole. It’s a nostalgic take on a boom period for North American and a great place for a quick bite to eat. The Price: It’s between £8 and £12 for the mains, with fries, and £4.50 for a milkshake. 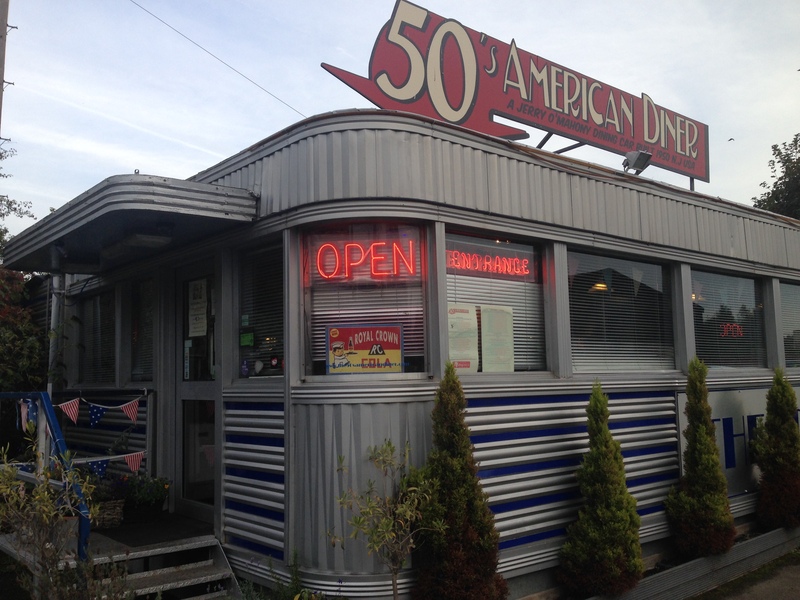 The 50’s American Diner was visited by Tom in October 2015. Posted in GresleyTagged 50's american diner, america, American Diner, buddy holly, burger, church gresley, derbyshire, diner, elvis, fries, gresley, Hot dog, JFK, joe di maggio, lunch, milkshake, North American, salamiBookmark the permalink.